Designed and created by Japanese scientists, a luxury Far Infrared sauna known as the SOQI Bed, used extensively across North America, Mexico and Asia. 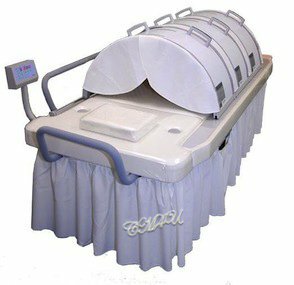 The SOQI Bed is the ultimate Far Infrared sauna, a total health and natural healing spa - consisting of three Far Infrared Domes and one Sun Ancon Chi Machine - built to lock down onto their own specially designed massage table bed, with built in speakers so as to include music therapy. Holistic Healing for Health and Wellness. Pure Luxury and Style - For Home or Business. The SOQI Bed with it's advanced Japanese technology is a proven, outstanding alternative healing solution, for every individual or family, that seeks to remain or become healthy, physically, mentally and emotionally. The SOQI Bed massage table has a storage shelf underneath and a built in MP3 player with two speakers on either side of your head, directed by the all-in-one control panel. Soothing music puts you into a meditative alpha state and the overall healing experience is intense and deeply relaxing - falling asleep is optional. SOQI Bed Sauna Spa - Natural Healing Energies. x6 Payments - No Interest. x3 Far Infrared Dome Sauna and x1 Chi Machine. with two head speakers for music therapy. HTE, a renowned International company - known for their cutting edge, revolutionary, advanced, alternative, natural healing products - has harnessed the medical and ancient scientific knowledge of Asia, combined with modern day technology and scientific research. Healing and wellness is generated by Far Infrared heat energy via the Far Infrared Dome, coupled with passive aerobic respiration exercise motion energy via the original Sun Ancon Chi Machine. Pamper yourself, or your clients. Excellent for home use, or for health care practitioners. A business tax write-off for professionals. or within any health and wellness practice. Worldwide, thousands of people just like you, are searching for safe, easy to use, painless, convenient, alternative, natural healing therapies without becoming dependent on toxic drug band-aids, expensive health care, or health club memberships. Most importantly, people are seeking to have something that works. The SOQI Bed can be set up within the comfort of your home, or within any health or healing business practice. Whether in perfect health or otherwise, the SOQI Bed is for everyone in all walks of life and settings. From housewives and business men to gym enthusiasts, professional athletes, children, the physically challenged and the elderly. There are no side effects involved, no pain, no needles, no invasive procedures and no medication. Simple, natural, safe, non-toxic, natural healing, for health, fitness and daily wellness. close to the body for optimal penetration and benefit. 1) Family - Set up a room or space in your home for your entire family to relax, re-charge, maintain health, and heal as needed. Stressed, tired, in pain, no energy, can't sleep, lacking mental focus, health challenges? This is a powerful, natural, non-toxic, without side effects, easy to use, long-term sustainable solution. 2) Create your own Home Business with the SOQI Bed Spa, for your community. 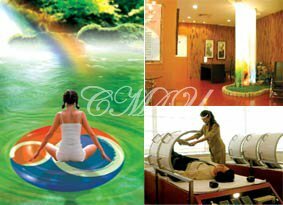 3) Massage Centers, Beauty Spas - The relaxing Chi Machine internally massages and stimulates the body, temporarily relieving muscle pain. The Far Infrared supports, maintains and promotes health and well-being. Both machines promote relaxation. 4) Fitness Centers, Health Clubs, Sports Teams - Warm up and cool down. The Chi Machine loosens up the body and promotes mentally clarity and focus. Ideal for sports injuries and pain relief. 5) Integrate or create your own exclusive SOQI Spa in your local town or city - SOQI spa centers can be found across Asia, Australia, Europe, Canada, Mexico and now the USA. 6) Corporate World - Many corporations worldwide acknowledge the importance of employee health. Set up a SOQI Spa room for lunch breaks. Healthy, focused, unstressed employees promote better productivity and less sick leave. 7) Health Care Professionals, hospitals and clinics everywhere. By using one, two or three Far Infrared Dome Sauna, you create a channel of healing far infrared ray thermal energy from your feet to your neck for 15 to 60 minutes per session or longer if desired. This cermaic heater for the body, emits pure Far Infrared Ray from the entire 160 degree, silicone crystal chip inner surface of each dome, at 8-10 microns, the most beneficial healing wavelength for humans and animals. 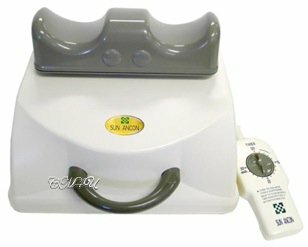 Use the original Sun Ancon Chi Machine at the same time for the motion energy of passive aerobic exercise. The Chi Machine oscillates at a very precise x144 per minute thus creating a perfect figure of eight, aligned with normal body functions as designed and intended by the inventor, Japanese scientist Dr. Inoue. 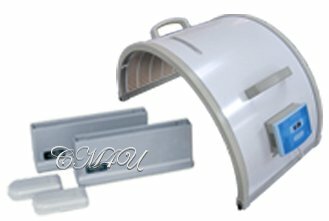 Far Infrared Dome Sauna and Original Chi Machine. Far Infrared Thermal Energy and Motion Energy. Everything in creation is movement. a color, a vibration and frequency. Movement of the body is critical to promote oxygen and elimination of toxins. Prolific acidic energy within the human body becomes toxic and stagnant if not eliminated which causes the body to malfunction resulting in pain and illness. 1) Imagine a pool of still, stagnant water - You cannot drink it and no healthy life form exists within it. Your body is around 75% water. 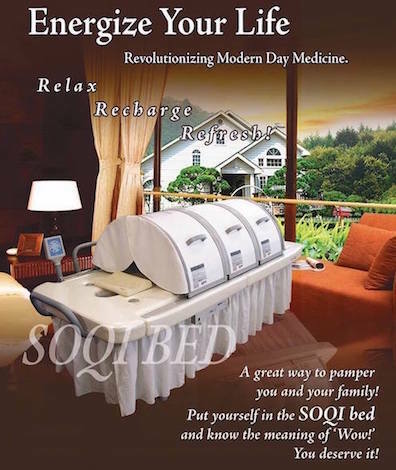 The SOQI Bed machines properties, maintain a healthy state of non-stagnation. 1) Music alters the vibrational frequency of your body by stimulating your emotional energy and thereby the ability to calm, uplift and inspire. 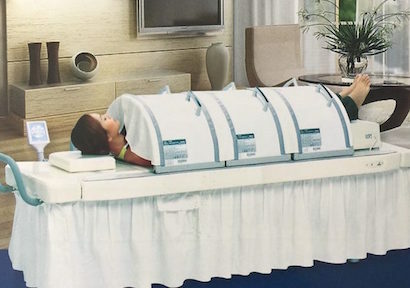 The SOQI Spa Bed has a built-in MP3 player so as to listen to your choice of therapeutic music - there are two tiny speakers on either side of the head. FYI: You may use head phones - simply unplug the speakers, attach an adapter and plug in the head set. 2) Energy has different colors, each having their own vibrational frequency - pink is soothing, green and blue is healing. Wall color, fabrics and accents can be used to set the tone in the room of a SOQI Spa Bed. 3) Feng Shui is the ancient Asian natural earth science of aligning and balancing the energy within your home or business. If your home or a particular room feels uncomfortable, you may need to rearrange, discard or change the colors and objects in it otherwise the misaligned energy can create physical and emotional upset. 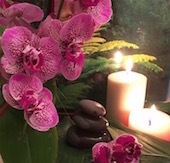 Creating a healing spa area in your home or business will generate flowing, relaxing energy. Stimulate, balance, align and replenish your bodies natural CHI energy and vibrational frequency with the SOQI Bed and thereby release and prevent energy from becoming stagnant and toxic. If you have any ongoing health challenges, use the SOQI Bed to stimulate and accelerate natural healing, along with an overhaul of your diet, your environment, and even your relationships if needed, all of which have the ability to create acidic toxic energy thereby affecting your mental, emotional and physical state. Consistent use of the SOQI Bed results in multiple health and healing benefits which obviously vary from person to person depending on the individuals particular health challenges, lifestyle and environment. And by the way, you may keep your clothes on as far infrared heat is dry, not wet as found in traditional saunas. 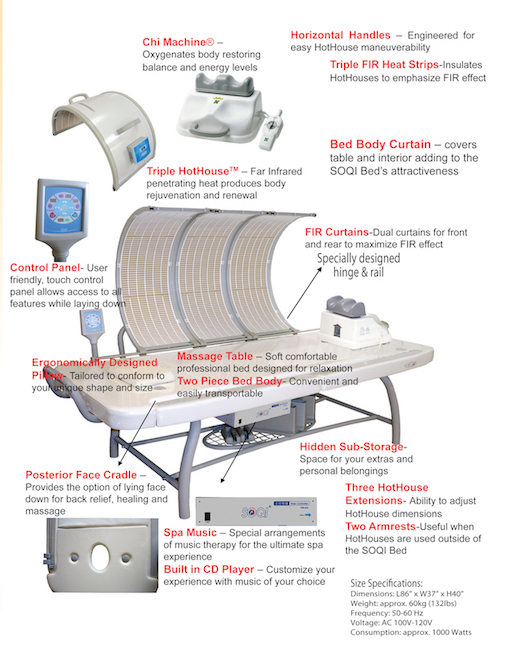 Far Infrared Heat Therapy - History and properties of Far Infrared. Research from Japan - Facts and data. A Far Infrared Sauna unlike any other. 1) Simply sit down on the SOQI Bed, put your feet on top of the Chi Machine ankle rest, close each Far Infrared unit - begin with the unit to cover your legs, then the unit which covers your lower chest, then the unit that covers your upper chest - or you can slide yourself in. 2) Set the single panel control to the length of time you desire for the Sun Ancon Chi Machine and the Far Infrared domes. 3) Choose and set the music you wish to listen to. 4) Lay back on the massage table, close your eyes and relax. Relax, de-stress, balance and rejuvenate. Calm and heal the body naturally, with no risk of injury. 1) You may use the SOQI Dome for 30 minutes to one hour straight, for general health and wellness. Be sure to drink plenty of water after use to flush out toxins. 2) The sauna dome may be used for longer than one hour at your discretion, depending on your health status and the ability of the body to eliminate toxins. Some bodies need to detox and strengthen at a slower pace. 3) As with any heated environment, make sure your skin is moisturized if normally dry. 4) If any rashes or excess redness occurs, stop for a few days, or reduce the length of session. 5) The company does not recommend using the dome over the head, but if so desired, simply place a wash cloth or sleep mask over your eyes - 5 to 15 minute session is preferable length of time. 6) People with metal rods, pins and plates, or breast implants, may use the SOQI Bed without concern of any negative effects. Unlike traditional saunas which heat up the body, Far Infrared will not heat or effect any internal metal hardware or implants. 7) People with open wounds and sores are advised to use Far Infrared dome at their own discretion unless wounds intentionally need to be closed. 8) Warning - You may fall asleep, ENJOY! The SOQI Bed Total Health Spa. 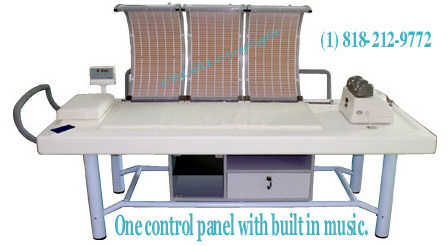 Luxury massage table with built in speakers, single control panel and four machines. Over 10 years of developmental research. Combined Far Infrared Thermal Energy and Motion Energy for natural healing, relaxation and rejuvenation. such as mp3, wma and wav. x3 risers, x2 arm rests. Height is 41" including Domes. - Alaska, Hawaii & Puerto Rico excluded. 24/7 Hotline - Any questions, anytime. HTE head office, Los Angeles, CA. Include: Improved circulation, relief from pain, swelling and inflammation, serious toxin elimination, accelerated healing, healthy lung support, relaxation, and much more. Regular heat does not accomplish this method of holistic healing. Three individual Far Infrared Domes with one Original Chi Machine. Include: Passive aerobic respiration, internal massage, increased energy, temporary muscle pain relief, healthy back support, mental focus and relaxation. Use in the comfort of home regardless of the weather or time constraints - simple, effective, 5-10 minutes that can change your whole day. Create Your Own SOQI Zen Spa.